Stall Space Advertising at the Entrance of Food Court in front of Burger King Outlet in Elante Mall, Chandigarh – one of the largest & most crowded Mall of North India. Massive Captive Audience with Footfall Of More Than 12.5 Lakhs People Per Month. Highly recommended Advertising Package for the brands seeking for personal contact with the target audience ensuring quality lead generation. Strategically Located on the entrance of Food Court which ensures your brand reach every individual visiting Food Court. Even accessible to the crowd going for PVR Cinemas, Fun City & other adjoining Mall Stores & outlets. An exclusive venue where you can easily answer the queries of your target audience. Highly Recommended Advertising Package By BMK Ensuring Huge ROI. Slide down for further details! Elante Mall targets population exceeding 12.5 Lakh people within a month. Captive Audience Crowd of more than 9 Lakhs people per month spending at least 1 hour quality leisure time while having their meals. Hence, ZERO AD AVOIDANCE. Huge ROI (Unconquerable medium among-st all medias in town). 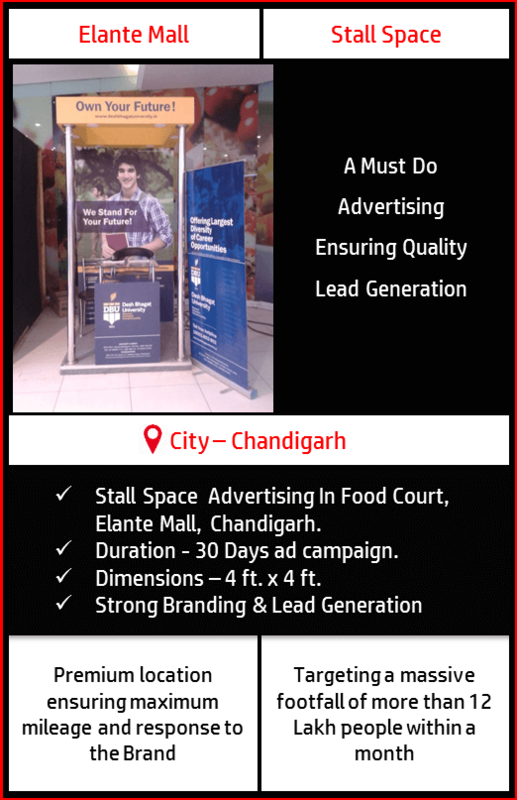 A Perfect & prime location to answer on the spot queries of your target audience. The best synergistic Location ensures the maximum mileage and response for the brand. The merchandise i.e. the complete stall would be provided by client himself. Also the installation would be done form client’s end. The client has to send the 3 D design of the stall to BIG MEDIA KART which would be approved by the Mall Authorities well in advance. Since mall is a public place, damage here and then can happen. In the case of the damage of the Stall due to whatsoever reason, the same would be intimated to Client within 48 Hrs. of the damage and Client would replace the Stall with the new one or rectify the old one if possible. The Stall’s finishing should be absolute and no sharp edges which may hurt customers. The client cannot indulge in any sales activities via the medium of the Stall. Look and Feel of the Stall should be perfect and should not look shabby as compared to the interiors of mall and look & feel of other stores. 18 % GST would be extra as applicable. Hygiene and cleanliness of the area to be ensured. 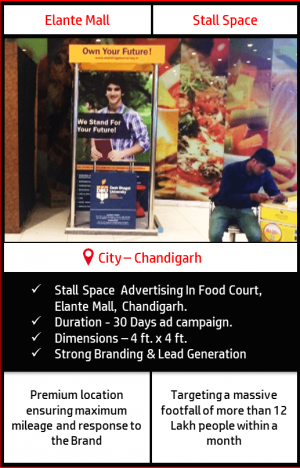 Elante Mall is one of the largest and most crowded mall of North India with best mixture of Business, Stay and Entertainment, the 3 pillars which every company or individual seek for in such kind of strong development project. The total area covered by Elante is 20 acres & is located in Chandigarh Most acknowledged as ‘The City Beautiful’. The three distinct facilities that this development provides to its customers are Retail mall, Office complex & Hotel with central courtyard. Elante is among-st the largest Malls in India having retail space of over 1 million sq. ft. with G+3 levels. Topmost national and international brands resides here under the same roof along with a proper mix of hypermarket, departmental stores, Sports Bar & much more. Elante Mall is exactly replica of the phrase “Entertainment, Entertainment & just Entertainment” which provides strategical & well established entertainment zones, multiplex and food court to cater to its customers. The mall witness a mammoth footfall every day which keeps the development the most happening place in the Tri – city . Hence, concluded as a must preferred location for the advertisers seeking to cater a huge crowd to give their brand a grand visibility.